A General Purpose Wagon typical of those used by civilians and armies on almost every Continent during the 18th, 19th & early 20th centuries (This is not the military GS Wagon). 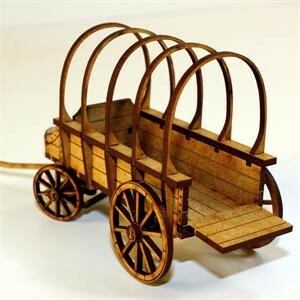 This wagon will enhance any gaming battlefield as an important objective or a sturdy defensive barricade. It can be made with either the canopy hoops or without.